A new prion disease has been discovered in dromedaries in the Ouargla region of Algeria. The study is the result of an international collaboration conducted by a team of researchers from the Department of Food Safety, Nutrition and Veterinary Public Health of the Istituto Superiore di Sanità and the Universities of Tlemcen and Ouargla. The research was published in the journal Emerging Infectious Disease . Prion diseases are neurodegenerative diseases with a fatal course affecting both humans and animals. The Creutzfeldt-Jakob disease of man and the scrapie of sheep and goats are the diseases known for a long time. To these it was added in the ’80s the bovine spongiform encepalopathy, the so-called “mad cow” that, in 2001 – following the demonstration of its transmissibility to humans – caused one of the most serious food crises that have ever been recorded globally. 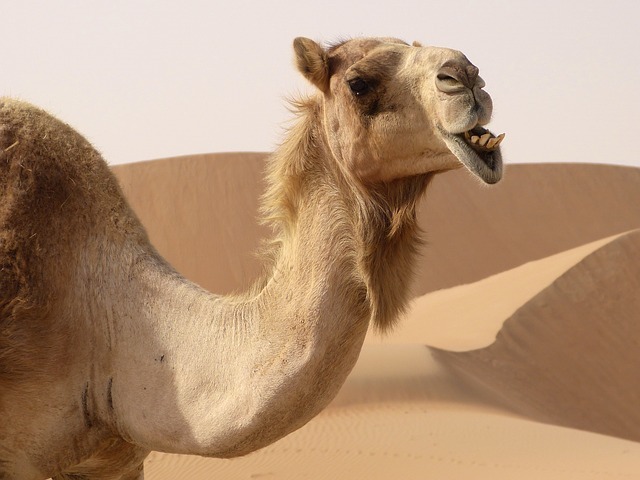 The neurological symptoms observed in the dromedaries, reminiscent of those of the “mad cow”, have made the Algerian researchers suspect that it could be a prion disease. The laboratory investigations conducted by the group of researchers of the Istituto Superiore di Sanità confirmed the suspicion. The new disease has been called Camel Prion Disease . The relatively high frequency of the disease and the involvement of the lymphoreticular system suggest that it is a transmissible disease among the animals and widespread in the region. Further investigations will be necessary to verify the possible spread of this disease in other areas of Algeria and in other countries. “The discovery of a new prion disease in an animal species of economic interest and food in large areas of the planet – says Gabriele Vaccari , head of the Emerging Zoonosis Operations Unit of the ISS – raises important questions of public health and food safety. The breeding of dromedaries is widespread throughout North and Central Africa, as well as in the Middle East, Asia and Australia, and is an important component in the economy of many populations. In many areas dromedaries are used for the production of milk and meat for human consumption “. The results of the investigations conducted so far suggest that the dromedary disease is different from bovine spongiform encephalopathy, the only animal prion disease demonstrated to date that can be transmitted to humans, with over 200 deaths in various parts of the world. However, the risk to humans is currently unknown and further investigation is needed to clarify its zoonotic potential. The recent update by the World Health Organization of the list of infectious diseases at risk of epidemic has included many diseases of zoonotic origin, demonstrating the importance of these diseases and the attention that must be paid, even with respect to the potential risk for man, discovering a new animal disease. Beyond the implications of animal health and public health, the discovery of a new prion disease has an indisputable scientific interest for the peculiarity of the agents responsible for this group of diseases and because the pathogenetic model of prion diseases has recently found wide and promising areas of application to human diseases of great interest such as Alzheimer’s disease and Parkinson’s disease. Prions are amyloid proteins that build up in the tissues of the CWD-affected deer. Amyloid proteins do not proliferate but can increase in amount biochemically. Bacteria can induce formation of these amyloid proteins. These amyloid proteins (prions) are not infectious. Research shows that the cause of CWD is a tiny bacterium. We have now grown this bacterium in broth culture and on agar plates so we now can develop a diagnostic test. This will be very important since the deer shows at least a 10 month incubation period where the deer is infectious yet shows no clinical signs. There is no way to recognize an infected deer until the last stages of the disease. Vaccines are common in controlling bacterial diseases. Brucella is controlled by a vaccine. You all know about pneumococcal vaccine. There are no antibiiotics that kill spiroplasma. There is no workable diagnostic serological test for the transmissible spongiform encephalopathies. CWD has been experimentally transferred to cattle so I wouldn’t be secure in any natural barrier to infection. The incubation period for CWD may last months. The animals appear normal during the first 10 months of the incubation period. Spiroplasma can be cultured and studied. A diagnostic test is now possible so that the CWD-affected animals can be culled. The diseased animals will be recognized by a simple serological test. The source of the organism in nature can now be determined. Since the spiroplasma forms colonies on agar plates, we can now determine sensitivity to new antibiotics. A preventive vaccine is now possible. We need more laboratories working on this problem from this perspective and that is why I published the method of isolation so any researchers with access to CWD materials can contribute.